The peaceful Indian Muslim myth is a fairytale that has been perpetuated by elitist Hindu liberals. It is one of those myths which is bought wholesale by both on the left and the right. But sadly like any other fairytale, it is not based on any facts. Look at the nature of political Islam from 1920 to 2016 and you will find that nowhere has it been more treacherous and lethal than in the Indian subcontinent. There are Islamic political movements in the middle east too, there was the Baath party in Iraq, Muslim Brotherhood in Egypt and various other groups but none of them led to the treacherous partition of a nation the way it did in India. The amount of brutality that India faced was also manifold. In fact, claiming that Muslims of the subcontinent are peaceful is the Hindu way to hide the shameful past of being pounded by the Muslims. The worst assumption one could make is that Indian Muslims are different from their Pakistani counterparts. Why so? Do they follow a different book? Obviously not. Go to any foreign nation and observe, the moment a Muslim from the subcontinent sets his foot on foreign land, he immediately severs his cultural roots and gets connected to the global Islamic political movements there. Just to give you a small example, there are many Change.org petitions about protecting Indian interests, how many Indian Muslims do you see participating in those? How many NRI Muslims do you see walking in rallies on the streets of US, UK to speak in favour of India? NONE! The moment they go there, they immediately connect their roots with the Ummah and subsequently you will find many Indian Muslims walking in rallies for Palestine, Lebanon, Kashmir, i.e. they whole heartedly support anti-west, anti-Israel and anti-India (basically anti-kafir) coalitions. The Ummah mentality of the Muslims of the subcontinent has not gone away, in fact, it has only strengthened with the onset of the internet and other communication channels. Wherever there are Muslims, there is always a problem. Don’t give more credit to someone just because they happened to be born in a certain geographical part of the world. They themselves don’t care about this geography, because they believe that international borders are artificial barriers which stop Muslims from linking to form a united Ummah. One does not choose the race one is born in, so it is incorrect to cast aspersions about race. However the same is not true for ideologies because ideologies are political opinions which one can choose to renounce or adopt. Islam is not a race, it is an ideology and unless you are making a claim that Indian Muslims have a different Quran than other Muslims, which they obviously don’t, peaceful Indian Muslim argument holds no water. An ideology at whose core lies antagonism against non-believers, cannot be an inclusive one, no matter how much PR spin you try to give it. A lot of those who claim Indian Muslims to be more peaceful than the rest of the world are sub-consciously linking it with Sufism. Even Akbar who was under the influence of Sufi saints, killed 6 lakh Hindus. In fact, all the Muslim rulers who committed atrocities on Hindus had Sufis in their cabinet. And still some people think that Sufism is peaceful Islam. The very fact that Hindus aren’t allowed to claim Ram Mandir is a testimony to the fact that Indian Muslims don’t adhere to a more evolved and tolerant form of Islam claimed by many. The thought process is the same as that of the invaders. Ram Mandir issue is not a real estate dispute and cannot be looked at from that angle. It’s a much deeper issue of constitutional violation of the religious rights of Hindus in an allegedly secular nation which allegedly guarantees religious freedom. Ram Janmabhoomi is to Hindus what Mecca is to Muslims, there can be no negotiation on this. The fact that we are stuck in negotiations reflects that Indian Muslims, have in fact NOT given up their ideological terrorism which stems from their need to dominate and persecute Hindus wherever they can. Reconciliation is a two way street where both parties agree to walk one step each and meet in the middle. If a case is being made that Indian Muslims are more reconciliatory in nature, where is the evidence? The iconoclasm of Indian Muslims is written all over the Ayodhya issue and is impossible to ignore. Then there is another pet theory peddled around by the Islam apologists according to which economic progress will lead to less radicalization, or by corollary implying that poverty leads to terrorism. This has been categorically proved to be false. A lot of people involved in Jihadi activities are upper middle class, educated people. Take a look at the Indian boys who went to fight for ISIS. They were working in MNCs with a salary of 12 lakh/per annum, which is more than what an average Indian earns. An average ISIS fighter earns a salary of 800$ a month. If money was the motivating factor to become a terrorist, I am sure many poor people would have agreed to join these groups for even 80$ a month given that 60% of the world lives in poverty. Why didn’t all those poor people join them? Surely they would have earned a lot of money had they been opportunists. That’s because people with a sane moral compass stay away from such ideologies even in the face of abject poverty. Please call the terrorists out for what they are, they are not economic opportunists, they are political dissidents. Europe which is economically much better and secular in nature did not stop hordes of local Muslims from joining ISIS. The Jihadis from Europe are all second or third generation immigrants who are decently educated but refuse to identify and connect with their local culture. For example- Osama bin Laden was a billionaire! But that did not stop him from taking to extremism. Extremism is a political ideology, an idea which transcends social and economic class barriers. For that matter, Shah Rukh and Amir Khan have no shortage of money, but they still indulge in Jihadi propaganda, or do they not? How much money do you think the government needs to give them to stop propagating those ideas? How much money do you think would Hafiz Saeed take so that he magically stops being a terrorist? Money is orthogonal to the issue of terrorism, it is a facilitator but not the driving force. The problem of ideological extremism is not going to go away by just throwing money at it. It is like throwing food at a wolf and expecting him to magically start behaving like a domesticated dog. He will eat the food but still continue to remain a wolf and your life is still under threat because you haven’t solved the core problem. The core problem is that unlike other fascist ideologies like Nazism and other forms of imperialism, Islam never underwent any reform because no one ever dared to tell them that. Germans today acknowledge Nazism was evil because they have been told by their history books about the horrors that it perpetuated. Japanese frown on Japanese imperial atrocities because they have been told about their follies by their history books. Islam, has never been told that the atrocities they perpetuated were wrong, so instead of undergoing reform, they continue to live in their own merry world assuming it to be ‘glorious’. So Hindus should stop patting themselves on their back and give peaceful certificate to the sub-continental Muslims. The history of Indian Muslims is far from peaceful. 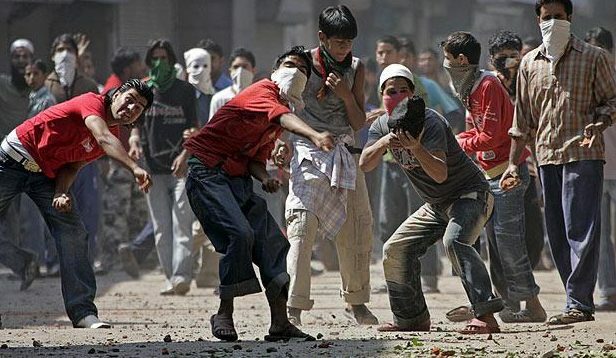 Even if one forgets pre-independence riots, in the post-independence period Muslims have already shown what they are capable of by throwing out Kashmiri Pandits from the valley, which was anything but peaceful. They were able to achieve this ethnic cleansing while fighting against the might of the Indian state machinery. The only hurdle in the achievement of this goal of dar-ul-Islam in rest of the country is the fact that Hindus still have demographic majority, which is slowly but steadily slipping away in many regions. The ethnic cleansing of minorities in Pakistan and Bangladesh should be a wake up call for all those who comfortably prefer to ignore this demographic reality. What is then the solution to this problem? The solution can be found but the first step is to acknowledge that there is no such entity called ‘Peaceful Indian Muslim’. Once, most Hindus acknowledge the existence of this problem only then the solutions can be found.